AllClass Carpet Care are the leading professionals for carpet cleaning in Canberra. Our dedicated, certified staff are qualified in everything from regular residential cleaning to large commercial cleaning projects. As Canberra’s longstanding go-to cleaners for homeowners, tenants, and realty professionals, we specialise in friendly, professional service and outstanding cleans backed by quality control inspections. 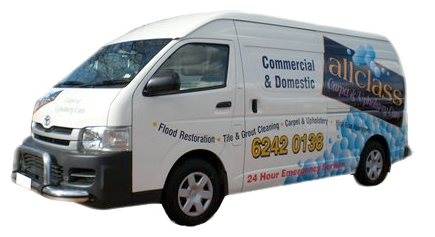 We provide 24-hour emergency carpet restoration for flood and water damage, upholstery cleaning, and second-to-none tile cleaning among our many services. We are also one of the few carpet cleaning companies in Canberra that are fully-equipped to clean high-rises and apartments. We are committed to perfection, so our expert technicians all receive ongoing training in accordance with the highest industry standards. Our large range of high-quality equipment is hand-picked to suit each job, and with three vans to service the Canberra area, we are as efficient as we are skilled. At AllClass we pride ourselves on quick response times, consistent high standards in all areas, competitive rates, environmentally friendly products, and above all, a real passion for our work. Call AllClass today and discover why we are Canberra’s most trusted carpet cleaning professionals. Our results speak for themselves.